Whenever I watch a reality television show, I like to imagine myself in it. Dropped down like an invasive species, I picture myself standing out for my candid groundedness and my “chill” personality. I would have no enemies. On the contrary, I would be the sole voice of sanity in an echo-chamber of delusion. My peers would come to me for advice, telling me again and again how thankful they are that I invaded their reality show, that I’m just so balanced and—wow—she even reads! But then one realizes, like professional wrestling, it’s all staged. One realizes the producers of Jersey Shore: Miami definitely directed Ronnie to move all the contents of Sammy’s room onto the balcony after she grinded with a guy at the club, because no fight is worth the energy spent pushing heavy beds and dressers across several yards of space. After a while, Ronnie probably got tired, the camera cut, and the PAs helped drag it all out, making sure to position everything messily enough to communicate his emasculated rage. We know it’s fake, but we love it—we’re here to see a good fight. Some primal urge gets satisfied when I watch Sammy come home and explode into tears, eyeliner running down an implausibly large surface area of her face. There’s something captivating about a melodramatic tiff; something delicious about seeing two people really hash it out. And if reality television gives us anything, it is the possibility of participating in a “real” fight without the repercussions of actually getting involved. This is not a piece about reality television, but something closely related: tiffs between the more “refined” class of public figures, artists. In the era of modern art, Henri Matisse and Pablo Picasso’s rivalry has been the topic of prominent exhibitions and books, mainly explored through their painting of the same subjects and sometimes even use of the same titles. 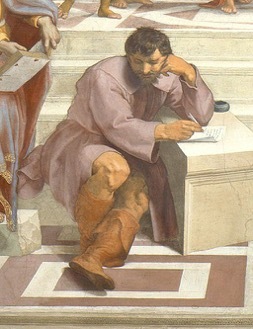 Their distinct painting styles have been likened to Nietzsche’s Apollonian-Dionysian dichotomy, placing the artists at either end of rationality and irrationality, of measure and indulgence. But it has been argued that the legendary proportions of “Matisse-versus-Picasso” are in part due to a PR invention of the poet and avant-garde booster Apollinaire, who wrote a press release for a “Matisse/Picasso” show at Paul Guillaume’s gallery in 1918. To drum up hype for the show, he described Matisse and Picasso as “the two most famous representatives of the two grand opposing tendencies in great contemporary art,” and that sentiment has been influential ever since. Picasso’s intersections of artistic genius, political involvement, personal scandal, and celebrity stature informed the public mythology surrounding his rivalry with Matisse. Similar intersections can be seen within the rivalries of Tupac Shakur and The Notorious B.I.G., Karl Lagerfeld and Yves Saint Laurent, Miles Davis and Wynton Marsalis. Today’s most prominent artistic feud, though, is one further implicated by a 24-hour media cycle and the hyperconnectivity alloted by social media. It is a story of Shakespearean proportions, one of two empires clashing: Taylor Swift versus Kanye West. The feud famously began on September 13, 2009, when a 19-year-old Taylor accepted the Best Female Video award at the MTV Music Video Awards for her song, “You Belong With Me.” During her speech, Kanye jumped on the stage and grabbed the mic, stating the now-immortal words: "Yo, Taylor, I'm really happy for you and I'mma let you finish, but Beyoncé had one of the best videos of all time. One of the best videos of all time!" Kanye was promptly kicked out, while Beyonce used her Video of the Year win later in the program as an opportunity to bring Swift back on stage and let her finish her speech. Nicki’s action was a critique of how establishment culture simultaneously fetishizes blackness while failing to recognize its merit (Kanye has stated that he felt his interruption was doing the same thing, as a “soldier of culture” who was frustrated with the denial of black culture). Miley’s unconcerned response—her twirling of her fake dreadlocks and her insistence on a “manipulation” by the industry—spoke volumes. The exchange was heavily documented on Twitter and Instagram, and “#MileyWhatsGood” took on a fruitful life of its own, much like how Moonlight’s Best Picture gaffe instantly turned into a viral meme. Thanks to live, reaction-based posting, viewers and non-viewers alike are able to collectively experience award ceremonies from our own couches. Social media allows any highlights to extend beyond the air, where fans, celebrity affiliates, and the feud-members themselves can provide commentary on a situation disseminating at real time. Indeed, this method of communication has been vital to the enthusiasm surrounding Kanye and Taylor’s feud post-2009. Whereas Matisse and Picasso one-upped each other through paintings, and Biggie and Tupac through diss tracks, today’s artists are expected to have an immediate public face, changing the way we expect them to fight. After something scandalous happens, we tend to anticipate a statement from the celebrity artist in question, usually in the form of a screenshot of their Notes app (stars, they’re just like us!). The publicist is dead: we want it straight from the horse’s mouth. Even Kanye, who still somehow embodies the “recluse genius in the studio” aura, has a surrogate public face: his wife, Kim Kardashian. Both Taylor’s and Kim’s online presences include a mixture of professional promotions, glossy photoshoots, and peeks into their “private” lives (usually in the form of pets, children, or their “process”). They both have apps that market “exclusive” content and “discoveries” into their worlds. And, perhaps most importantly, they both have built empires. The similarities between Taylor and Kim’s public faces made for a weird, augmented-reality ride. 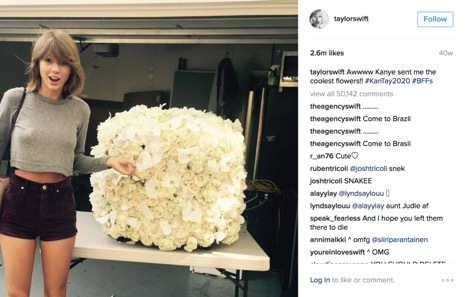 In under one year, the status of Kanye-versus-Taylor went from Taylor posting an open-mouthed Instagram with the caption, “Awwww Kanye sent me the coolest flowers!! #KanTay2020 #BFFs” to a saga of such proportions, we started needing condensed summaries like this. The saga, of course, was ignited by the reference to Swift in Kanye’s song, “Famous,” and the subsequent Snapchat videos, sub-Tweets, Notes screenshots, and award show call-outs that ensued. So many snake emojis flooded Taylor’s comments that they became directly associated with Taylor and her feuds. In an act of reclamation, Taylor then used a snake video to promote “Look What You Made Me Do,” the first-released single from her new album, Reputation. Her fans followed suit, opting for the rat emoji to flood Kim’s Instagram out of respect for their empress. Like reality television, artist feuds in the viral spotlight use language familiar to us, resembling some form of real life. They satisfy our voyeuristic impulses to watch the drama go down in “real” time, and allow us to invest our opinions in a safe, saucy debate. In a day and age when anything a celebrity does gets instantly regarded as a marketing ploy, it is difficult to decipher between the real and the fake. But, as symbols of culture, and maybe ourselves, it’s even more difficult to not root for one side or the other. Let the games begin.